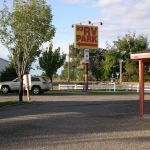 Ask fellow campers about "Twin Falls 93 RV Park" and nearby attractions. Very clean. Easy to navigate and nice pull through space. Was windy so we rocked a bit, but that didn’t bother us much. The bathrooms and laundry room were very clean and tidy. Self check in was easy to do. We camped at Twin Falls 93 RV Park in a Travel Trailer. All hook-ups were close and easy to connect. Water had good pressure (use regulator) and clear with no aroma. Large pet area. Streaming WiFi available for a fee. Free Wi-Fi was fast enough for basic internet and email. Did not try to stream TV. Excellent Verizon Mi-Fi connection. Our site had quite a bit of slope causing the front wheels to lift off the ground when leveling. Highway 93 noise was noticeable during the day and evening. Seemed to quiet down at night. We had no over spray from the sprinklers on our coach. Don't expect to see water going over Shoshone Falls in the fall as they have the river diverted for irrigation purposes! Also Twin Falls only has water on the weekends after 1 September! Power dropped in the mornings when everyone had their electric heaters running. Otherwise it was stable with good voltage. We camped at Twin Falls 93 RV Park in a Motorhome. Thanks for taking the time to review us! glad you enjoyed your stay as well as the wifi. Yes Shoshone Falls is not in full affect again till MAY! Also we have WATER YEAR ROUND i am not sure why your review says after september 1st! We are OPEN YEAR ROUND WITH WATER 24/7 365 days a year! Thanks fore reviewing us! Nice park, The one draw back is the irrigation lawn sprinkles. They come on early in the am and wash the whole side of your RV with very hard water. At 8am the gentleman that was park across from me need to put on a rain coat to disconnect his Electric, water and sewer. Sprinkler heads need to be aimed at the lawn and not the RV space. We camped at Twin Falls 93 RV Park in a Motorhome. Shopping in Twin Falls and viewing the falls. Thanks for taking the time to leave a review we are very sorry for this, we have since fixed the issue! Stayed 8 nights, including the 4th of July holiday, in one of their newly added sites. That was way to long for this park. Most are just overnighting here. Pros: Huge dog area (partial fencing) Close to Twin Falls Friendly staff Cons: Poor hot water in showers Knees will hit the stall door when sitting on toilet. Power issues when 3/4 full. Can't imagine what it is like when full. Turned sprinklers on for 30 minutes at 4pm several days making us scramble to keep items dry. No apology offered by office for this, just told us that the grass was dying. In short, feels like a money grab by the owner and no real care given for the quality of stay. Power was weak at times. Our EMS tripped several times for low voltage. We camped at Twin Falls 93 RV Park in a Travel Trailer. We are proud new owners! We purchased the park and expanded it and plan remodel of the laundry and showers. We agree the prior owners planned it poorly. It takes time to remodel as we've been constructing sites for the past year and have only had them open 4 months. We've never encountered power problems. Had you asked, maintenance could have diagnosed if it was your problem or ours. Our office personnel should have had a better answer than they just work there. That sounds unusual for how our longtime employees are trained. This is unacceptable to us so please contact our office personally ask for the manager and that issue will be addressed with the employee. We are happy to offer discounts on future stays for issues that are our fault. But if we don't know when you are there it is hard to address. Please contact our office and ask for the manager to return your call so we can see what site and date you were there. We have never had wifi issues as our system is state of the art. Nice large sites, clean only problem is the hwy 93 truck traffic at night and early morning. We camped at Twin Falls 93 RV Park in a Motorhome. Thanks for taking time to rate us and leave a review we value all feedback! Knowledgeable and helpful staff. Clean restrooms and showers. Good Verizon wireless and MIFI signals although we used their free wifi. LOTS of tv channels on the antenna. (First time using our antenna, too.) Water, power and sewer all there for us. We camped at Twin Falls 93 RV Park in a Motorhome. The Visitor Center coming into town from I-84 just south of the Perrine Bridge is well worth the stop. RV parking is available there. Thank you so much for taking the time to review us, So glad you enjoyed your stay! Come back soon and see our new expansion! First Impression: Nice roadside presentation; major construction as 43 more sites are being added. Safety: No concerns. Access: Follow US-93 south from I-84 from Twin Falls to Filer. Past US-30, look for CG on left. Not hard to find. Big sign, Garmin GPS is accurate. Office: Friendly attendant, no store. Credit cards accepted. Online reservations available but $5 fee - call instead. Good Sam discount. Facilities: No pool, spa, fitness room or rec center. Small, very clean laundry room. Very modern restrooms. Showers are clean, modern, tiled, with changing area behind privacy doors (Score "A+"). Propane sales. No playground. No off-leash dog run. Campground: Not in a flood plain. No storm shelter. Lightly wooded. Interior roads are dirt/gravel in good condition with gentle turns and no overhead obstacles. Big rig and long coach friendly. Prevosts shouldn't have problems. No tent area, yurts, or cabins. Sites are all quite close, not very level, gravel, all pull-through, grass between. Utilities at mid-rig with FHU-20/30/50; no meters. Adequate water pressure with good taste. Sewer pipe is 3" threaded, ranging from ground level to 6" high. No patios; good picnic tables. No room for ground fires. Marginal satellite views (trees). No cable TV. OTA TV found 32 channels (but no ABC). Free Wi-Fi with weak coverage (1 bar just next to office); acceptable bandwidth. Verizon phone at 5 bars; 4G at 3 bars. No recycle bins. Noise: No railroad, aircraft, traffic, or interstate noise. Bug Report (mid August): small red ants. Hornets (no issue). Runners: CG roads marginal for running. Yoga: grass areas should be okay for your mat. Conclusion: Score 5-Acceptable. We camped at Twin Falls 93 RV Park in a Fifth Wheel. Thank you so much for taking the time to write such an awesome detailed review about our park, We appreciate the feedback, Hope you enjoyed your stay! Stay tuned for our new expansion hope to see you back soon!! 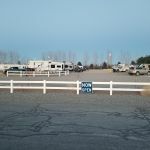 This park is one of the nicest fair rv parks we've been in, no one was available to check us in, so the host texted to find a spot and he would catch up with us. We liked the park, 50 amp, sewer and excellent water. Grass sites and dusty interior roads, but so quiet and peaceful. Showed wifi but we were unable to connect. Lots of tv channels on the antenna. 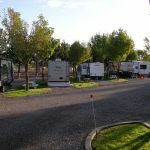 Convenient to twin falls, Idaho (6 miles) We camped at Twin Falls 93 RV Park in a Fifth Wheel. We ended up pulling in straight instead of backing in, and the rv in front of us said he was told it was ok. You have to go to Shoshone Falls...an absolutely breathtaking spot! We also went to the Perrin Bridge but there were no base jumpers when we were there. Thank you Ginny For leaving us a review! So glad you enjoyed your stay, Hope to see you back soon!! Easy park to get in and out of. Lot of construction going on as they're expanding the park for more big rig spaces. We stayed for a week and would stay here on our next visit. We camped at Twin Falls 93 RV Park in a Motorhome. For taking the time to give us a review/rating, We are so glad you enjoyed your stay and thank you for mentioning our expansion, it will bigger and newly improved you next go around! We came and paid for the Month which was $400 + elec. After we moved into our space we found the "Free Wifi" was non existent. We complained and nothing was done. Then they had a construction worker living there with his wife and 2 out of control kids that ran and screamed inside the trailer all day! Complained but it didn't stop. Finally after 2 weeks we had enough with the place and wanted to move. The owner and the manager refused to pro rate our money and tried to throw us out immediately. We found another better park nearby. I will obviously never go back and will share my experience with others, so beware of this place. We camped at Twin Falls 93 RV Park in a Travel Trailer. As with others, this park is well taken care of. Grass area between sites, not large but sufficient. Sites are level, to a point. Yes the bathroom toilet area is cramped, but they are "CLEAN". They are in the process of adding approx. 30 some new pull thru sites. 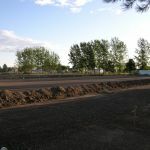 Shopping areas are about 7-8 miles away in Twin Falls. All services worked as they should. Traveling with 7 other rigs and no one complained about anything not working as they should. If in the area again would stay here a second time. Although they have a connection for cable TV, they do not have cable. Only 6 stations available via over the air. We camped at Twin Falls 93 RV Park in a Motorhome. Thank you for taking the time to rate/review us, We are glad you enjoyed your stay and cant wait to have you guys back, We are expanding and "super WiFi " is on our list, which will allow you to watch live tv netflix, etc. Not fancy but well kept. In a field just outside of town. Need toad to go get supplies in town. All pullthru sites. Good hookups. Very few trees. Easy in and out. Right on highway. Bathroom/showers were clean but seemed very claustrophobic. The stalls had plastic curtains instead of doors. Laundry 2washers/2dryers and very clean. I would stay here again. We camped at Twin Falls 93 RV Park in a Motorhome. Good base camp. Not a destination camp. No pool. No activities. No playground. A few full time residents. Pricey for a spot just off the highway. Bathroom is a tight space with knees against the door. We camped at Twin Falls 93 RV Park in a Fifth Wheel. Thank you for taking the time to rate us, We are working on fixing these issues. Hope to see you soon! A very nice park that's in the process of expanding. Ground's very well kept and the wifi connection was decent. This park is very conveniently located to downtown and very easy getting in and out. We stayed for five nights and will definitely come back again if we ever come this way. We camped at Twin Falls 93 RV Park in a Fifth Wheel. Very clean and well maintained. The staff very helpful. They said as well, that they are in new ownership and doing more to enhance the property. We stayed 5 nights and were quite happy. Small park. Quiet. Will definitely stay again. We camped at Twin Falls 93 RV Park in a Motorhome. Close to Twin Falls and conveniences as well as site seeing of the amazing falls. The Snake River and Canyon area are beautiful. About 9 miles from the CG. Kayaks, hiking, loads of shopping and plenty of nice restaurants. Shoshone Falls is 10 minutes away. Hagerman Fossil Beds and Malad Gorge are nearby along the Thousand Springs Byway, Route 30W. Lots of base jumpers on the Perrine Bridge at Snake Canyon Gorge on US 93. Highway 30 takes you to city center/Albertsons. Pole Line Road works better for bridge and park. Nice farmers market. Shoshone Falls is amazing, as advertised! Too bad for the houses built there, but the falls are still gorgeous, even at lower flows (due to diversion for ag). 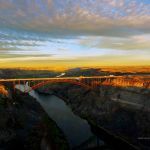 The Snake River canyon (overlooks on 93, Centennial Park, etc.) are incredible. Surprised by all the great scenery, given the basic flatland topography! We enjoy the Twin Falls area. Many things to see and do in the area. 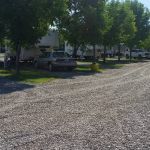 The campground is about 8 miles from a big shopping area , with a mall, Costco, Walmart, grocery stores, and restaurants. Snake River is close-by, Jackpot Nevada about 30 miles south. This park has an RV store right there on site. The people there are wonderful. GO stay if you are traveling through. 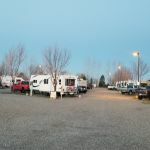 Are you affiliated with Twin Falls 93 RV Park ?